There's nothing quite like an Amish made hutch, and the Amish Galloway Shaker Three Door Hutch is full of creative storage and display options. Shaker style furniture is strong and functional and wears a no-nonsense outfit beautifully. This wood hutch brightens the room with three upper cabinets, a gorgeous display shelf, three drawers and three lower cabinets. We can't wait for you to bring home custom furniture with your chosen options. 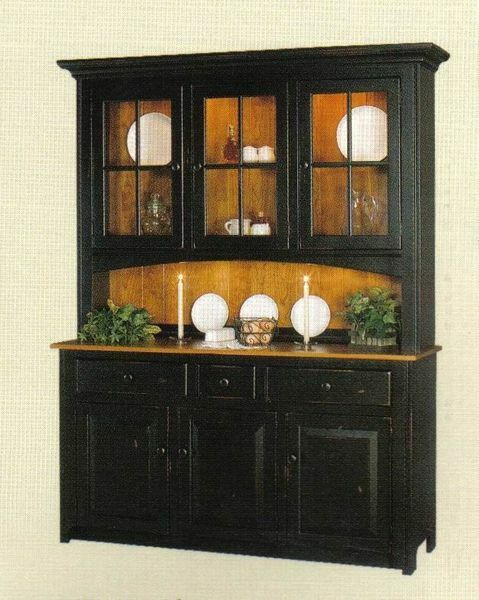 This hutch comes in your choice of oak, cherry, or brown maple wood with a variety of finish colors to pick from. You can order samples to work with at home to find your perfect match. Please email or call today with any questions about our custom furniture. Thank you for shopping with DutchCrafters. Hutch Top Depth: 14 1/2"